Untreatable tuberculosis: is surgery the answer? According to the 2014 World Health Organization (WHO) Global Report, tuberculosis (TB) continues to be the most important infectious disease in terms of incidence and mortality, along with HIV/AIDS: 9 million new cases and 1.5 million deaths are estimated to have occurred in 2013 . Although we have effective drugs and regimens to treat drug-susceptible TB cases, challenges to successful treatment of drug-resistant TB have posed a substantial threat to global TB control efforts . The increasing prevalence of multidrug-resistant (MDR)-TB (caused by mycobacterial isolates resistant to at least two of the most potent antituberculous drugs, isoniazid and rifampicin) and its related mortality are cause for concern among the scientific community and policy makers [2, 3]. WHO estimated that 3.5% and 20.5% of new and previously treated tuberculosis cases were MDR-TB in 2013, respectively, 9.0% of them harbouring extensively drug-resistant (XDR) strains of Mycobacterium tuberculosis (i.e. resistant to any fluoroquinolone and to at least one of the second-line injectable drugs, amikacin, capreomycin and kanamycin, in addition to isoniazid and rifampicin) . The global programmatic capacity to diagnose and treat these cases is largely suboptimal. Out of the estimated 300 000 MDR-TB cases, only 136 000 (45.3%) have been diagnosed and 97 000 (32.3%) are treated using adequate regimens based on drug susceptibility testing (DST). Consequently, the treatment success rate of MDR-TB is low (48%): ∼47 000 patients who recovered clinically and biologically in 2013 . Important information is available from the largest observational, retrospective, meta-analytic cohort ever assembled, which included almost 10 000 MDR-TB cases (>400 of them being XDR) [4–6]. The proportion of MDR-TB cases treated successfully was 62%, with 7% failing or relapsing, 9% dying and 17% defaulting. In the XDR-TB subgroup, treatment outcomes were even worse: 40% achieved treatment success, 22% failed treatment or relapsed, 15% died and 16% defaulted [4–6]. In the subgroup of XDR-TB cases with the most severe drug resistance pattern, the success rate is only 19% and the negative outcomes (failure and death) are as high as 49% . Clinicians working in MDR-TB reference centres know perfectly well how difficult it is to administer simultaneously at least four drugs to which strain is considered to be susceptible. This condition is necessary to follow the WHO recommendations, to offer the patient a real chance of cure and to prevent further emergence of acquired resistance to drugs . Treating MDR- and XDR-TB is a difficult and long process, and second- and third-line drugs are toxic and expensive. The third-line drugs (linezolid and meropenem, among others) are used off-label, although limited evidence is available on their safety and tolerability [8–11]. Linezolid, for example, has been described as a very toxic drug based on the risk of severe and that, sometimes, life-threatening and irreversible adverse events can occur including anaemia, thrombocytopenia, peripheral neuropathy, optic neuritis and gastrointestinal disturbances [9, 10]. Cost of treatment is another challenge. For example, direct treatment-related costs of MDR-TB patients can amount to €52 259 in Germany, while the average cost to treat an XDR-TB case in Europe largely exceeds €160 000 [12–14]. In this alarming scenario, the development of new drugs needs to be accompanied by sound policies to introduce them in a rational manner in order to protect the patients from one side (they have the right to be treated with safe and effective drugs) and, on the other side, to protect the new drugs from drug resistance [15–18]. Adequate administrative, clinical and public health interventions are needed to address the determinants behind the emergence and spread of drug resistance. After four decades of neglect, two new drugs have finally been approved by the international regulatory agencies (i.e. Food and Drug Administration in the USA and European Medicines Agency in Europe): bedaquiline and delamanid. When added to effective backbone anti-TB regimens designed as per WHO recommendations , they have shown preliminary evidence of short- and long-term efficacy, being safe and well tolerated [19, 20]. When few therapeutic options remain, and more and more patients are moved back to the pre-antibiotic era, old interventions (widely used in the first three decades of the last century) need to be re-evaluated based on evidence: first among them, surgery. The first surgical intervention on a TB patient was carried out by E. Barry in 1726, followed by C. Forlanini in 1882, who performed an artificial pneumothorax. 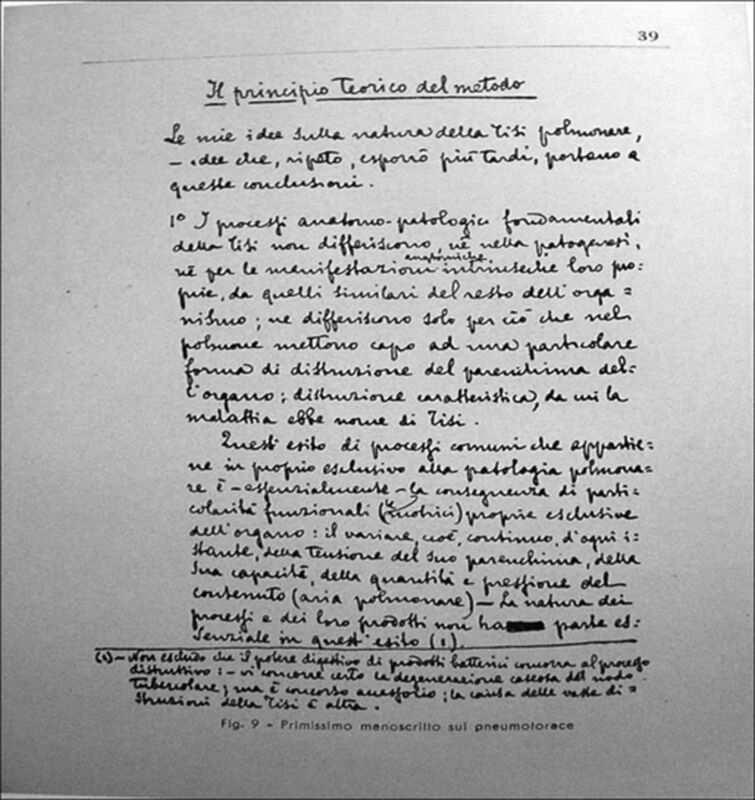 The first page, hand-written by C. Forlanini in 1907, describing how to induce pneumothorax by injecting air in a controlled manner within the interpleural space is presented in figure 1. Between those two relevant historical surgical interventions, other surgeons gained positive experiences: Spengler in 1890 with thoracoplasty and Tuffier in 1891 with a wedge lung resection. Other positive surgical advances were recorded by Monaldi (thoracostomy), Lilienthal (pneumonectomy) and Freedlander (lobectomy). “First manuscript on surgical pneumothorax: the method's theoretical principle”. Reproduced from  with permission from the publisher. Two examples of difficult-to-treat MDR/XDR-TB cases in which surgery combined with chemotherapy achieved cure are shown in figure 2. 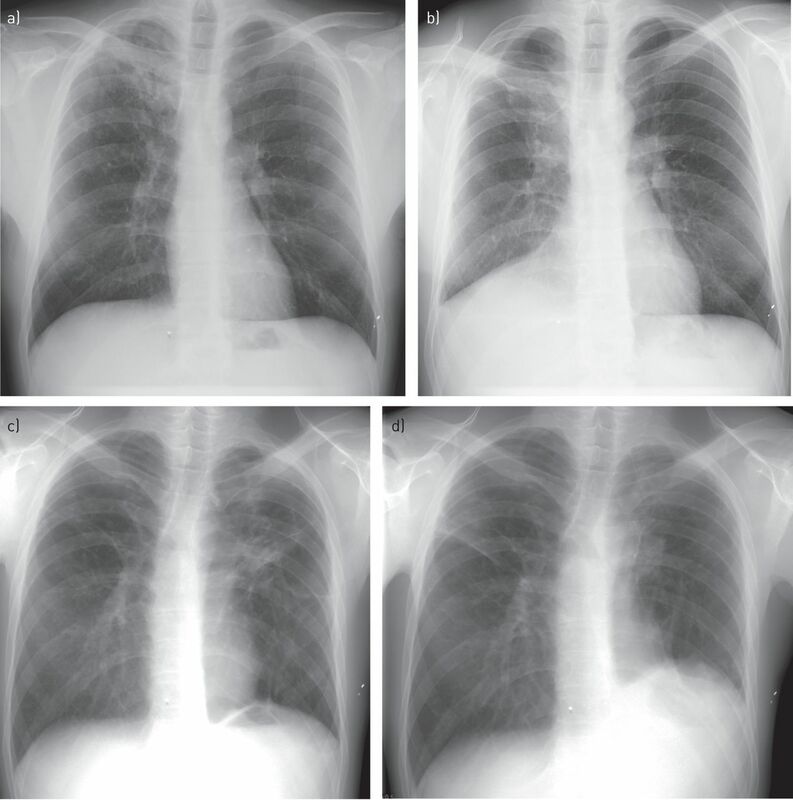 Two examples of difficult-to-treat multidrug-/extensively drug-resistant tuberculosis (TB) cases in which surgery combined with chemotherapy achieved cure. Case 1: a) cavity located in the right upper lobe surrounded by a consolidation; b) chest radiography after right lung lobectomy. Case 2: a) left lung cavity with disseminated foci in both lungs; b) chest radiograph after left lung polysegmental resection. Images courtesy of Linda Barkane (Latvian Center for TB and Pulmonary Disease, Riga, Latvia). Two important documents recently discussed the role and contribution of surgery to the treatment of MDR- and XDR-TB. In some settings, practitioners have argued that with timely surgical intervention in addition to medical treatment, the chance of cure may be higher if the lesions are limited to some lobes or segments of one lung and the patient is diagnosed as early as possible. In 2013, a systematic review/meta-analysis by Marrone et al. was published in the International Journal of Tuberculosis and Lung Disease. The authors retrieved 24 studies published between 1975 and 2012. The treatment success rate was statistically higher in patients undergoing surgery if compared with those treated with anti-TB drugs only (OR 2.24). All-cause mortality decreased by 24%. The positive effect of surgery on treatment success almost doubled in the subgroup of XDR-TB patients (>400 cases, OR 4.55) if compared with that of the MDR-TB patients (OR 2.27). Similar efficacy was demonstrated in the reduction of all-cause mortality when the analysis was stratified by drug-resistance pattern subgroup. Interestingly, the authors demonstrated that surgery had higher efficacy when M. tuberculosis strains were resistant to more than four drugs. The evaluation of short- and long-term outcomes carried out in individuals undergoing surgery (but without a control group) scored 92% and 87% success, respectively. In addition, some cases of extrapulmonary TB, for example, Pott's disease or abscesses not responding to medical treatment, there is a need for surgical operation. In November 2014, a consensus document, involving global TB experts and coordinated by the WHO Regional Office for Europe, discussed the role of surgery in pulmonary TB and MDR/XDR-TB based on the available evidence . A panel of 17 experts (representing a wide spectrum of expertise, including experienced surgeons), after series of meetings summarised the current evidence and provided their consensus. This initiative was included in the Consolidated Action Plan to Prevent and Combat Multi-Drug and Extensively Drug-Resistant Tuberculosis, endorsed by the WHO Regional Committee in Baku, Azerbaijan, in 2011 . Relevant scientific evidence was searched for in PubMed and in the grey literature, in English and Russian, as many countries of Eastern Europe apply surgical interventions in management of pulmonary TB. Observational studies only were retrieved and analysed. The absence of randomised, controlled and experimental studies decreased the quality of the findings, because of the observational nature of the evidence and the increased risk of selection biases. The study confirmed the efficacy of surgery in localised forms of TB (including drug-susceptible, drug-resistant and MDR-TB), particularly after drug exposure for 4–6 months. Indications for surgery include drug failure, localised pulmonary lesions, good pulmonary reserve and low risk of surgical complications (table 1). In any case, irreversible pathomorphological changes in the affected lung(s) are a significant additional indication for surgery. A collapse-surgical approach (pneumothorax) is suggested if the latter conditions can hinder the lung resection. Surgery should be conducted in specialised centres identified at the national level, which are equipped with sound administrative and environmental infection control activities. A case-by-case and consensus building approach including a team of different specialists (pulmonologists, anaesthetists and thoracic surgeons) was strongly recommended. The group also summarised contraindications for surgery (table 2). Among the limitations of the study, the heterogeneity of the target population, the absence of TB/HIV-co-infected patients and the variable duration anti-TB chemotherapy before and after the surgical intervention need to be underlined. The experts' working group agreed on the importance of promoting new randomised clinical trials which could better assess the role of surgery and the selection criteria. From a public health perspective, MDR/XDR-TB prevention starts with treating and curing all newly diagnosed cases who are drug-susceptible, and as many existing drug-resistant cases as possible with all possible means, including surgery, so that they stop transmitting TB infection within the community. This simple principle is particularly difficult to implement in the MDR/XDR-TB hot spots (e.g. in the countries of the former Soviet Union) where transmission of drug-resistant strains of M. tuberculosis within the community is rampant [1, 25]. By publishing the new End TB Strategy, with its three pillars, WHO has launched a new vision centred on the new concepts of TB pre-elimination and elimination (defined as <10 and 1 case per million, respectively), which the European Respiratory Society has endorsed and supported [26–30]. As TB (and MDR/XDR-TB) does not respect borders, no TB elimination is possible till the prevalence of drug-resistant TB is lowered at the global level. The authors would like to thank Linda Barkane (Latvian Center for TB and Pulmonary Disease), who kindly provided the chest radiographs of the MDR-TB patients. World Health Organization. Global Tuberculosis report 2014. Document WHO/HTM/TB/2014.08. Geneva, WHO, 2014. Drug resistance beyond XDR-TB: results from a large individual patient data meta-analysis. Eur Respir J 2013; 42: 169–179. World Health Organization. Guidelines for the programmatic management of drug-resistant tuberculosis – 2011 update. Document WHO/HTM/TB/2011.6. Geneva, World Health Organization, 2011. Efficacy and safety of meropenem-clavulanate added to linezolid-containing regimens in the treatment of MDR-/XDR-TB. Eur Respir J 2013; 41: 1386–1392.
. Facing multi-drug resistant tuberculosis. Pulm Pharmacol Ther 2014 [In press DOI: 10.1016/j.pupt.2014.04.006]. Ensuring rational introduction and responsible use of new TB tools. Outcome of an ERS multi-sectoral Consultation, Rome, July 3rd, 2014. Eur Respir J 2014; 44: 1412–1417. A mutation associated with clofazimine and bedaquiline cross-resistance in MDR-TB following bedaquiline treatment. Eur Respir J 2015; 45: 554–557.
. Preventing and managing antimicrobial resistance: imperative for chest physicians. Eur Respir J 2011; 37: 978–981. , ed. La Tuberculosi in Italia dal 1882 al 1950 [Tuberculosis in Italy from 1882 to 1950]. Milan, Federazione Italiana contro le Malattie Polmonari Sociali e la Tubercolosi, 2003. Surgical interventions for drug-resistant tuberculosis: a systematic review and meta-analysis. Int J Tuberc Lung Dis 2013; 17: 6–16. The role of surgery in the treatment of pulmonary TB and multidrug- and extensively drug-resistant TB. Copenhagen, WHO Regional Office for Europe, 2014.
. Consolidated action plan to prevent and combat M/XDR-TB in the WHO European Region 2011–2015. Copenhagen, WHO Regional Office for Europe, 2011. Alarming levels of drug-resistant tuberculosis in Belarus: results of a survey in Minsk. Eur Respir J 2012; 39: 1425–1431. Towards tuberculosis elimination: an action framework for low-incidence countries. Eur Respir J 2015 [In press DOI: 10.1183/09031936.00214014]. You are going to email the following Untreatable tuberculosis: is surgery the answer?